Characteristically late to the party, Canon has unveiled its line of PL-mount cine primes. 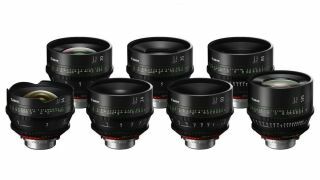 The Sumire Prime series comprises seven superfast lenses, compatible with cinema cameras equipped with Super 35mm or 35mm full-frame sensors. As noted, Canon is somewhat late to the dance with its line, as companies like Sigma and Samyang already offer a wide range of prime cine lenses with PL mounts. Where the Sumire line differs is in speed, with the 50mm and 85mm lenses being T1.3, as well as in image character. The Canon lenses deliver very three-dimensional images, helped in no small part by the bokeh produced by the fast apertures. They are also pin-sharp, produce lifelike skintones, handle flare well and offer a diffused look – a real rarity for modern cinema lenses. The lenses will cost $7,410 each - so that's over $50,000 if you want the full set. That's obviously a huge outlay for the average videographer using one of the regular consumer models in our best 4K camera list, but not for professional cinematographers in the TV and movie industry. The lenses are available for pre-order from Adorama. While lightweight compared to most cinema lenses, they offer the professional build quality expected by the film industry. In addition they all share the same 114mm diameter lens front, which also supports 105mm screw-on filters. Interestingly, while each lens comes with a PL mount as standard, they have been designed to be easily converted to a standard Canon EF mount (and back again) at an authorized Canon Service & Repair Center. This might suggest that Canon is once again trying creating a bridge between its various systems, enabling users to 'graduate' to a higher end system with their existing equipment. Much as the Canon EOS R and RP enable APS-C users to bring their EF-S lenses with them when they graduate to full-frame photography, the Sumire lenses might tempt cinematographers using a Canon EOS 5D Mark IV to invest in a proper cine lens, which can then be converted from EF to PL should they subsequently upgrade to one of Canon's Cinema EOS cameras. What is a cine lens? So how do cine lenses differ from standard stills lenses? The primary difference is that cine lenses are parfocal, while stills lenses are varifocal. This means, when it comes to using zoom lenses, that a varifocal lens will literally vary your focus as you zoom in and out (your subject will also 'breathe', meaning subtley grow or shrink); a parfocal lens retains focus even when you zoom (and 'breathing' is minimized). Since they are made for the cinema industry, cine lenses possess far more robust build quality, superior optical quality, more markings, and more precise manual control rings (with long throw and hard stops for zoom and focus, as well as dedicated and clickless aperture rings). Finally, cine lenses measure the aperture in T-stops rather than f-stops. A T-stop is far more accurate than an f-stop, which is a theoretical value based on a lens' focal length. By contrast, a T-stop is a value that has actually been measured and tested – this is the 'transmission', meaning the amount of light that is actually transmitted via the lens. Cinematographers live and die by T-stops, so they're a requisite for cine lenses. What is a PL lens mount? The PL, or 'positive lock', is a lens mount developed by Arri – one of the leading producers of cameras, lenses and equipment for the motion picture industry. In analog filmmaking the PL mount is designed for use with 16mm, 35mm and 65mm cameras. In digital filmmaking it is compatible with a number of cinema cameras (such as the Alexa, Sony F35, Phantom and Canon C300 PL) as well as other cameras (like the Red One, Sony A7S, Panasonic GH5/S and Blackmagic Pocket Cinema Camera 4K) using a mount adapter.